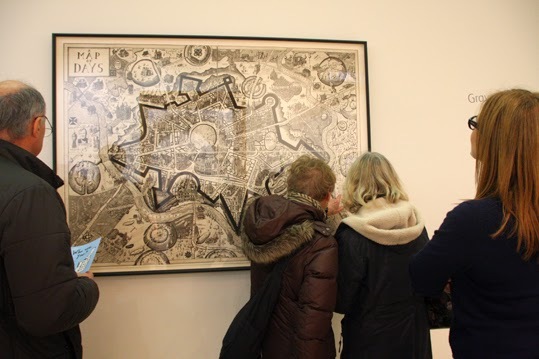 Last week I met up with a friend in London to go the the Grayson Perry exhibition at the National Portrait Gallery - and I really enjoyed it. Grayson Perry's work is profound, thought-provoking and incredibly well crafted. He produces artwork in a wide variety of media - ceramics, prints, woven tapestries and paintings - and all done with masterful execution. I'm going to admit I didn't know that much about Grayson Perry before I went to the exhibition - I'd vaguely heard he'd won a Turner prize but that was it. It was really my friend's idea to go to his exhibition, which is called Who are You? It isn't primarily concerned with what people look like, more about the nature of identity. The card I picked up about it at the National Portrait Gallery said: "Our sense of selves feels constant but our identity is an ongoing performance that is changed and adapted by our experiences and circumstances." My favourite piece from Who are You? is Map of Days - Grayson Perry's self portrait in which he depicts himself as a fortified city, with a permeable wall as the skin on the body and inside that structures and paths that are our own constructs rather than our essential being. There is a short video on the Channel 4 website in which he explains his thoughts behind the print - that what might seem like a central pearl at the core of ourselves is really just emptiness and all the stuff that we think of as ourselves is constantly shifting. I find that idea insightful and inspiring, but then as a psychogeographer I'm someone who loves the thought of cities being more than just bricks and mortar too. And perhaps that empty self is the point we try to reach through meditation - that point when all the walls we put up and masks we wear slip away and we experience the blissful peace of not thinking about stuff for a brief moment. The photo at the top shows Map of Days surrounded by people looking at it on the wall of the National Portrait Gallery. Who are You? is a free exhibition - so do pop in and have a look yourself if you are in London. The Channel 4 website also has a series of documentaries on Grayson Perry's Who are You? I'm going to watch them when I next get some spare time. On each Pagan Eye post, I show a photo that I find interesting, with a few words about it - a seasonal image, a pagan site, an event, or just a pretty picture. If you want to send me a photo for a Pagan Eye post, please email it to badwitch1234@gmail.com Let me know what the photo shows and whether you want your name mentioned or not. For copyright reasons, the photo must be one you have taken yourself and you must confirm that you are submitting it for A Bad Witch's Blog.